Modern Database Management 10 Edition Provide the latest information in database development. Focusing on what leading database practitioners say are the most important aspects to database development, Modern Database Management presents sound pedagogy and includes topics that are critical for the practical success of database professionals. 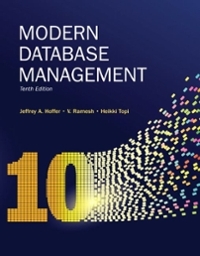 This text also continues to guide readers into the future by presenting research that could reveal the “next big thing” in database management.The tenth edition reflects the major trends in information systems and helps readers acquire the skills the need to be successful in today’s database management field.